Bandaid - Spokane, WA, USA Not a good product "This windshield was easy to mount but after two rides I lost all four of the set screw that hold the windshield in place after constantly tighten them. The trim molding around the windshield is coming off in about five places. The excess glue get on the windshield and is hard to get off. I have clamped it numerous times and it dose not stay put. All the mounting hardware keeps coming loose even thoI keep tightening it. I have not used LockTight as I am not sure where I want the windshield set. It dose not stay put when the ATV is being trailered. I would not buy another one." JoAnn SS-2 nice "The windshield works nice. There would be somethings that I would be careful with. 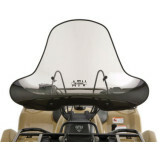 When putting the windshield on make sure you have something to protect it so it does not get scratched. If would be nice if the company put a film over it so you could peel off when done. We scratched ours installing it. Also, the rubber around the windsheild was coming off easily slid back on but now have black smudge from adhesive. Otherwise nice size and coverage. Fast delivery even before the holiday!"